This is designed for Windows Phone 8.1. For Windows 10 and above, please download "Bugko - MTG Tool" instead. Bugko formally known as MTGBugs NEXT, the most popular MTG app in Windows Phone store. Bugko is a all-in-one companion tool designed for Magic: The Gathering (MTG) players and judges. Bugko focused on offering unique core features such as news aggregation, spoiler alert, tournament deck list update, DCI point tracker, card syntax search and many more. 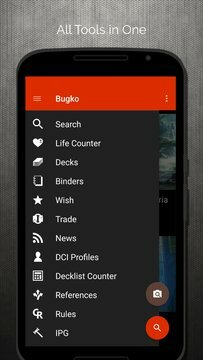 Other familiar features like life counter, wish list, collection tracker, offline card search, random card, comprehensive rule, deck building are also built inside Bugko for a complete experience. 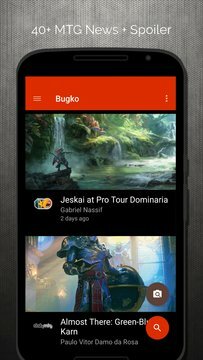 Bugko will be the first modern designed MTG app you will truly enjoy. Bugko is the only app that bring together all favourite MTG, MTGO and Arena news sources into one place. News channel currently available including Channel Fireball, MTG Goldfish, Mythic Spoiler, Star City Games and 40+ news sources. You can scroll through all news and spoilers happening right now once you open the app. With push notification in app, you surely will never miss a single important news update from your favourite news channels. Latest spoiled card? Bugko got you covered. Bugko is built with a powerful yet offline accessible cards database. You can choose to search through 30,000+ cards using our blazing fast syntax search designed for power users or simply use the search filter available with user friendly interface. With latest card pricing directly from TCGPlayer and Cardmarket, you can check, buy, trade or track your collection wherever you are. Are you a Magic judge? Bugko has tools specially designed for judges. Scripted draft timer, Infraction Procedure Guide (IPG) reference, Magic Tournament Rule (MTR) document, offline comprehensive rule with complete search functionality inside etc. Many of the features in Bugko are carefully designed to cater to the needs of judges as well. For example an offline card database, card text in multiple languages, judge blog or news update and more. Great for judges that travel around the world for events. Disclaimer: Magic: The Gathering (also known as MTG) card design, text, images, expansions, symbols and also DCI number are trademark and copyright of Wizards of the Coast, Hasbro, LLC. Bugko is not affiliated with, endorsed, sponsored, or specifically approved by Wizards of the Coast LLC.